The conclusion of a Star Trek fans’ convention? 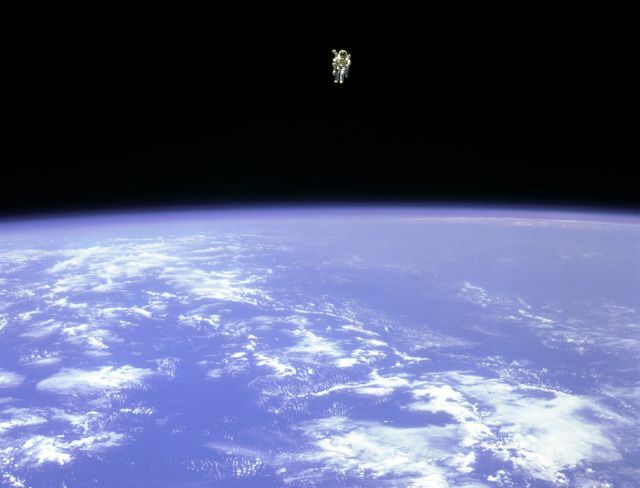 Nope: this is 25 years ago, and the commission in question is the US National Commission on Space, launched by the House of Representatives, and with a membership appointed by the President – including a former head of NASA, legendary test pilot Chuck Yeager (immortalised in Tom Wolfe’s book and film The Right Stuff), and Neil Armstrong. The quotes are from a rather wonderful book published shortly after its report came out, entitled The Overview Effect, which was written by Frank White – a senior associate at Princeton University’s Space Studies Institute, who was heavily involved in the commission’s work. It’s kind of striking how much more introspective our public discourse has become over the intervening quarter-century. You just couldn’t write stuff like that today and expect to be taken seriously. Now, the shuttle program has been killed off; manned space missions haven’t been outside Earth orbit since the 1970s; and I’d probably be rash to predict that Mars will be settled within my lifetime. “You identify with Houston and then you identify with Los Angeles and Phoenix and New Orleans. And the next thing you recognize in yourself is that you’re identifying with North Africa – you look forward to that, you anticipate it, and there it is. “And that whole process of what it is you identify with begins to shift. When you go around the Earth in an hour and a half, you begin to recognize that your identity is with that whole thing. That makes a change. You look down there and you can’t imagine how many borders and boundaries you cross, again and again and again, and you don’t even see them. There you are – hundreds of people in the Mideast killing each other over some imaginary line that you’re not even aware of and that you can’t see. But it’s also true of the rest of us. After all, the images of Earth from space that came back from the Apollo missions probably did more to shape modern attitudes to the environment than any other factor since the second world war. And at a point when we’re failing to get to grips with so many global risks – above all climate change – anything that makes us think of ourselves in more planetary terms is undeniably a Good Thing. Maybe it’s time to get excited about the Final Frontier again. Update: there’s a recent interview with Frank White here.